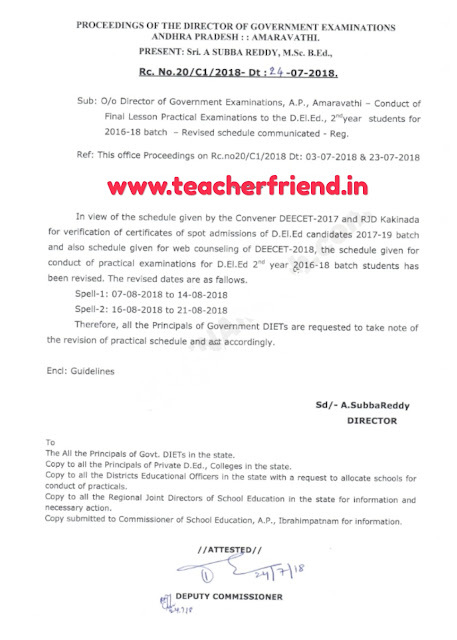 AP D.El.Ed/DEd 2nd year 2016-18 batch final Lesson Practical Examinations Revised schedule from 07/08/2018 to 21/08/2018 as per Rc.No: 20/C1/2018- Dt:24 -07-2018/AP D.El.Ed/DEd 2nd year 2016-18 batch final Lesson Practical Examinations Revised schedule as per Rc.No:20/Andhra Pradesh Primary Elementary Education (D.El.Ed/DEd) 2nd year 2016-18 batch final Lesson Practical Examinations Revised schedule as per Rc.No:20. 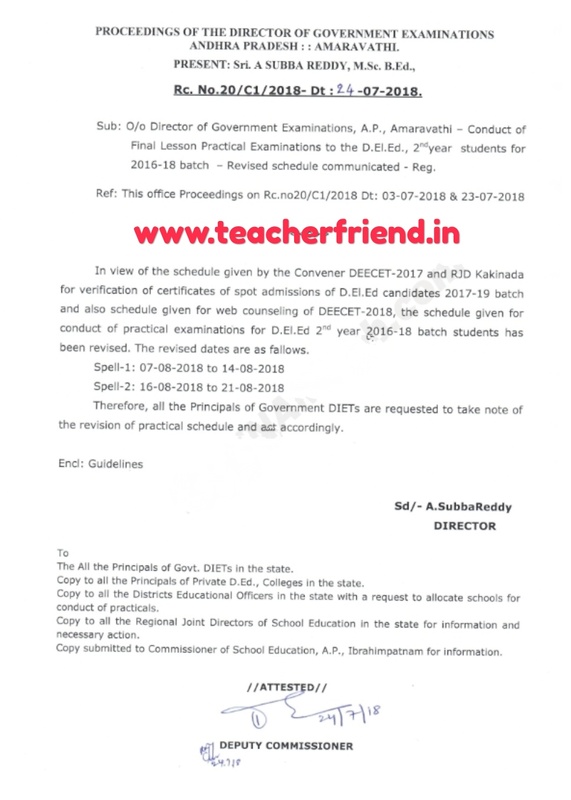 AP Director of Government Examinations, Conduct of final Lesson Practical Examinations to the D.EI.Ed., 2nd year students for 2016-18 batch Revised scheduled communicated as per Rc No 20/C1/2018- Dt:24 -07-2018. AP D.El.Ed/DEd 2nd year 2016-18 batch final Lesson Practical Examinations Revised schedule as per Rc.No:20. This office Proceedings on Rc.no20/C1/2018 Dt: 03-07-2018 & 23-07-2018. New** AP DElEd 2nd Year Examination Scheduled Time Table Click Here. Therefore, all the Principals of Government DIETs are requested to take note of the revision of practical schedule and act accordingly.